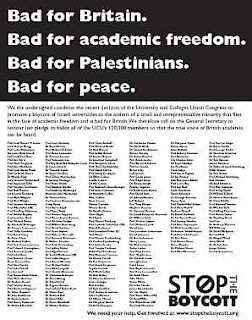 Nearly 300 [over 300 since] university presidents signed on to a full-page advertisement in Wednesday's New York Times protesting the academic boycott of Israel. “Boycott Israeli Universities? Boycott Ours, Too!” read the ad, organized by the American Jewish Committee in response to a proposed boycott of Israeli academic institutions by the British University and College Union. The ad featured a statement by Lee Bollinger, president of New York's Columbia University, endorsed by the other presidents.